Travel and food are two words that go together for me. Whenever I’m on holiday, enjoying the food of another place is a major part of my enjoyment, and finding out as much as I can about local cuisine. I loved the food I had while staying in Crete a week ago: it was very simple fare; no posh restaurants but simple local tavernas. But for me, simple food with the best, freshest local ingredients is as exciting as a Michelin starred place. It all comes down to doing things well and loving what you eat. Inspired by a holiday, it’s fairly standard for me to want to recreate some of the food I had while away once home and so having Jonathan and Lyndsey round to supper last night was a perfect excuse to go Greek. 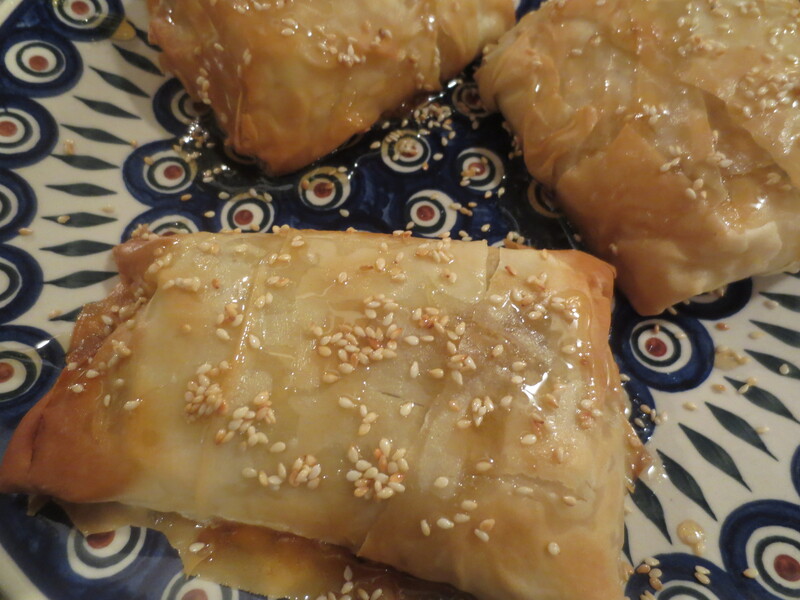 A lot of the time in Crete, I ate a selection of meze – even as my main meal – and particularly enjoyed those I had a Meraki, a taverna just below my apartment and one of my very favourite meze were Traditional Cheese Parcels with Honey & Sesame. So that was definitely a dish that would be part of my supper. I found recipes in both Jamie Oliver’s Jamie Does and Tonia Buxton’s Tonia’s Greek Kitchen. They’re incredibly easy to make. 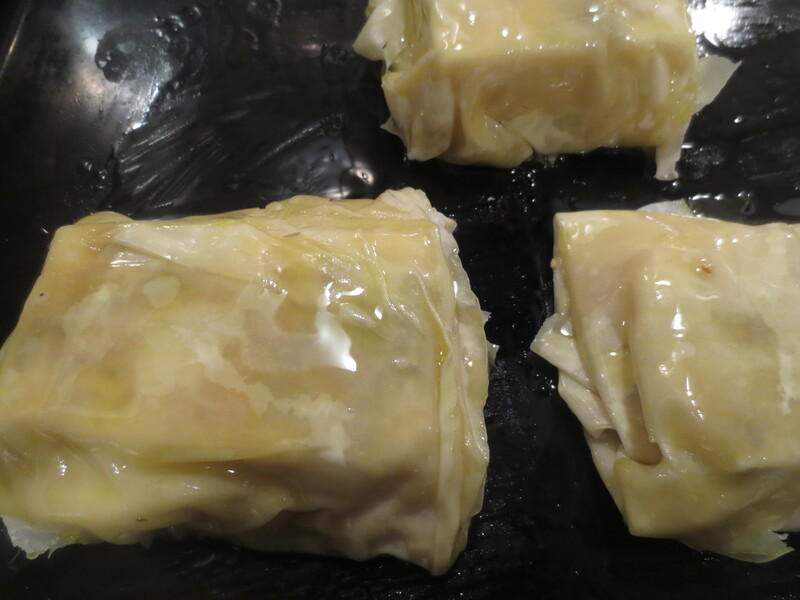 I bought a pack of frozen filo pastry with six sheets, which would make three parcels – perfect! 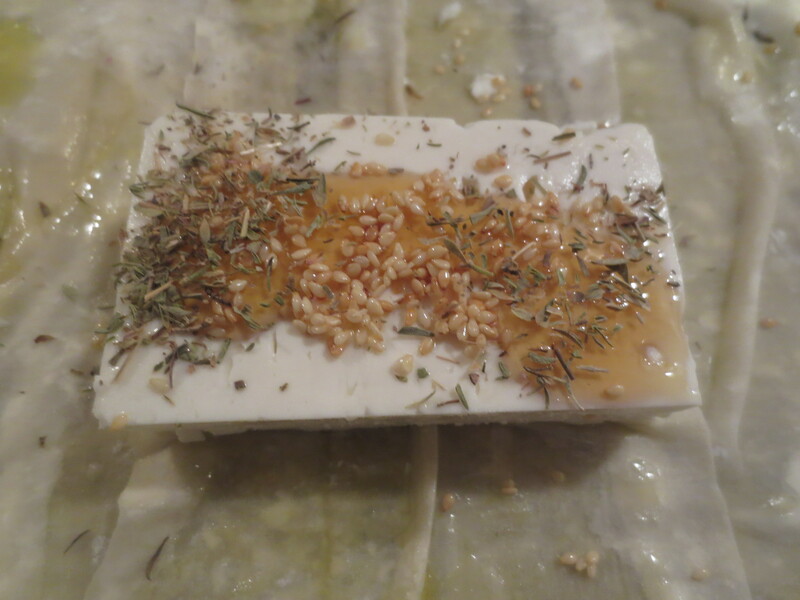 Lay one sheet out and brush with extra virgin olive oil; lay a second sheet on top and again brush with oil. Then put 100g (half the usual 200g slab) of feta in the middle. Drizzle over a little honey, a few toasted sesame seeds – and I added a little Greek thyme I’d brought back with me, a la Jamie. Fold over the pastry and wrap into parcels. Brush with more oil and put in a 200C /180 Fan oven for about 30 minutes, until nice browned. Use a slice to carefully transfer to a plate and drizzle over some more honey (I warmed mine with a little raki I’d brought back – Jamie suggests ouzo) and sesame seeds. They’re quite large – because there was so much other food, we had just half each. You could, of course, make smaller parcels, especially for a party when you want finger food to hand round. Jamie crumbles his cheese up and flavours it with the honey, sesame, thyme and oil before using as a filling. I chose to have a slab – like Tonia – as this was how it was served to me in Crete. Whatever way you choose to make up these parcels, they are wonderfully delicious: the saltiness of the feta, sweet honey and the lovely softness of the cheese once cooked. I always had them as a meze, but you can serve them as a dessert/cheese course too. I had to make a moussaka. 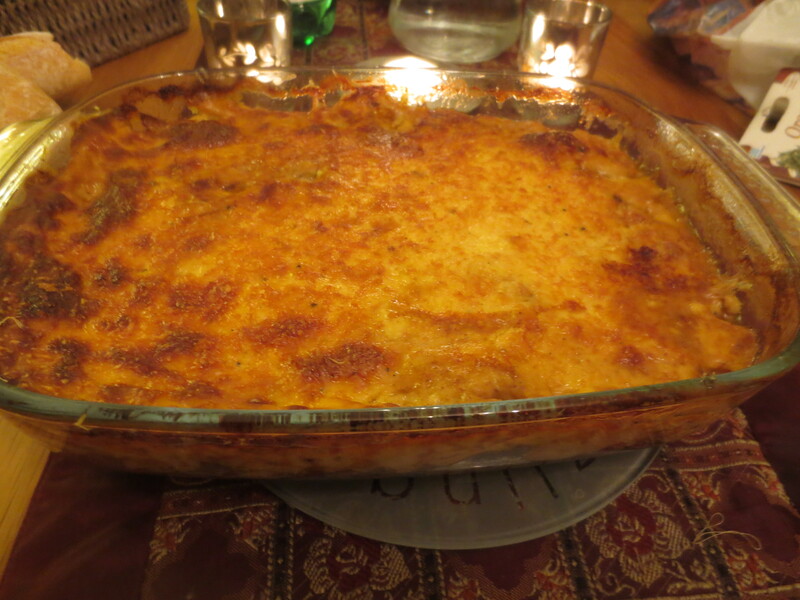 I just love moussaka (click here for recipe). I decided to make some stuffed peppers too. Well, actually I’d planned to make stuffed tomatoes but when I weighed three beefsteak tomatoes in Waitrose and the price was nearly £6, I couldn’t bring myself to spend such a ridiculous amount of money on three large tomatoes. So, I picked up two packs (4 peppers) of organic peppers for almost half the cost, instead. Again, I consulted Jamie and Tonia. Now, I’ve made stuffed peppers (and tomatoes!) many times for many years, but wanted to see what they both brought to the ‘Greek’ style. Tonia adds meat, but because I was making moussaka, I didn’t want to do that; Jamie added pistachios. I’ve no idea how authentic that it in Greek cooking but I liked the idea. So, a large onion was chopped and softened in olive oil with a crushed clove of garlic. 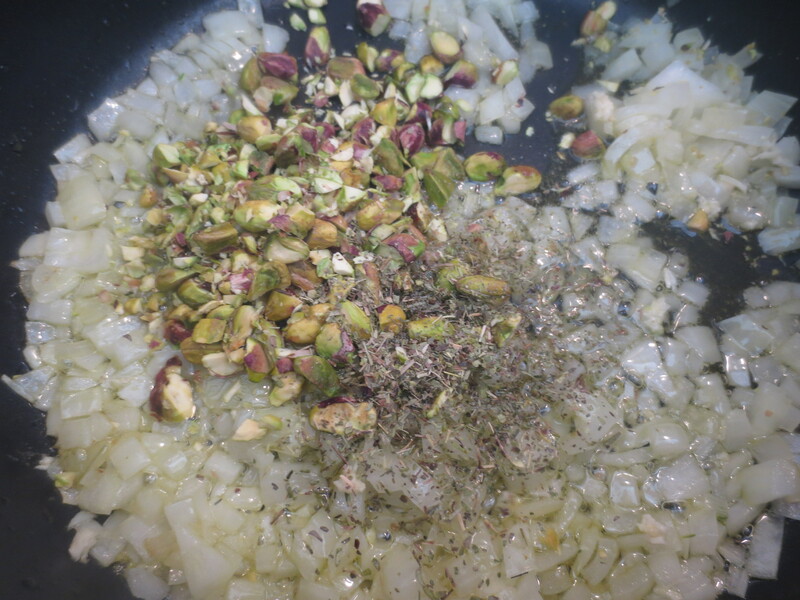 I sprinkled in some dried oregano (also brought back from Crete), 1/2 teaspoon cinnamon and 50g chopped pistachios. Then I added 100g long grain rice and stirred this round for a couple of minutes to make sure each grain of rice was coated with oil. Then I added a 400g can chopped tomatoes, 100ml water (or stock) and 2 tablespoons chopped parsley. Season with salt and pepper and allow to gently bubble away for a few minutes until the mixture becomes drier and the rice is almost cooked. Meanwhile, cut the tops off the peppers and scoop out the seeds. Stand is an ovenproof dish. If they don’t stand well – a couple of mine didn’t – cut a thin slice off the bottom. Fill with the rice mixture and then pop the lids back on. Mix 50ml olive oil with 100ml water and juice of 1 lemon and pour round the bottom of the peppers. Cover them loosely with some foil and put in a 200C/180 Fan oven for about an hour. My timing was a bit out as Tonia has said 30 minutes cooking time. This wasn’t nearly enough. Looking again at Jamie, he suggested and hour and fifteen minutes – this would have been better. 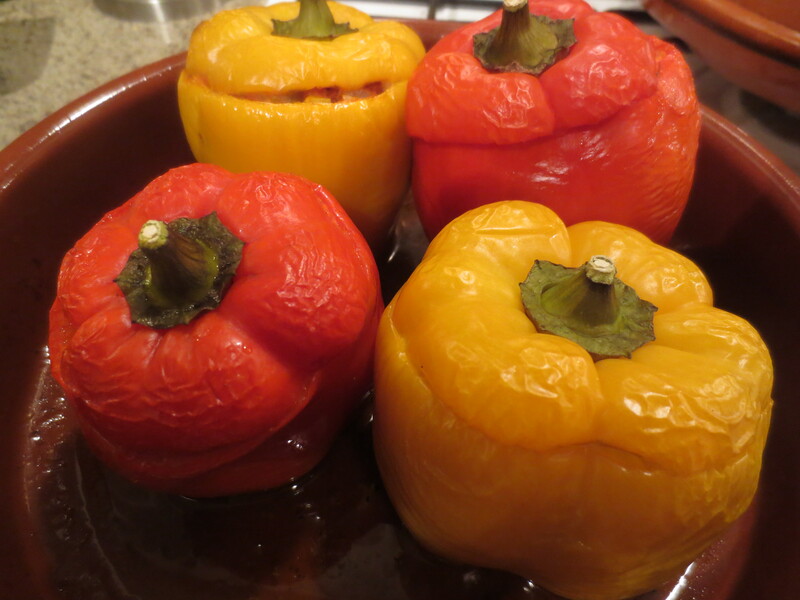 So, it ended up with the peppers going straight from oven to table and not having time to cool to lukewarm – the Greek way – and perhaps another time I’d cook them for even longer. They still tasted very good though! Everything just went on the table so we could eat it as we wanted. 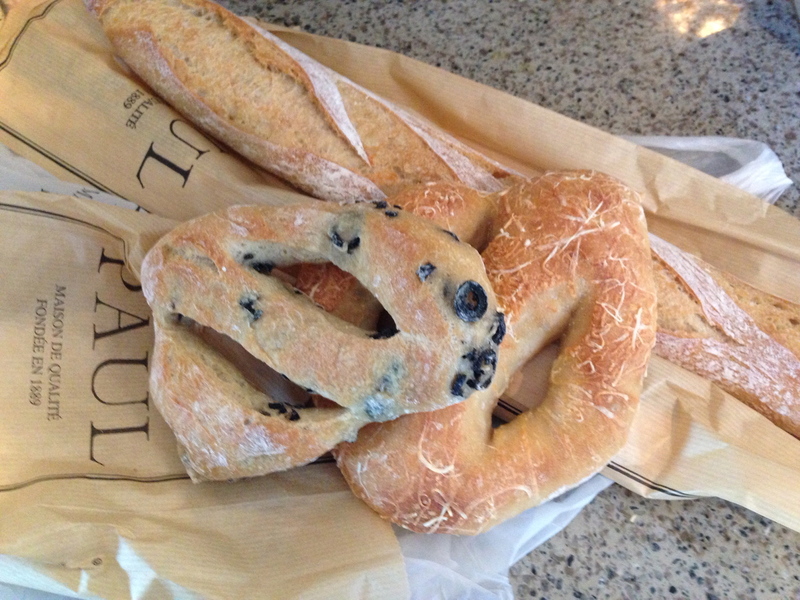 There were olives I’d brought back from Crete and some lovely bread – a flute and some fougasse – from Paul bakery. Not Greek maybe, but a delicious accompaniment. For dessert I decided to recreate a simple dish I was given twice in Zygos taverna in Istron. 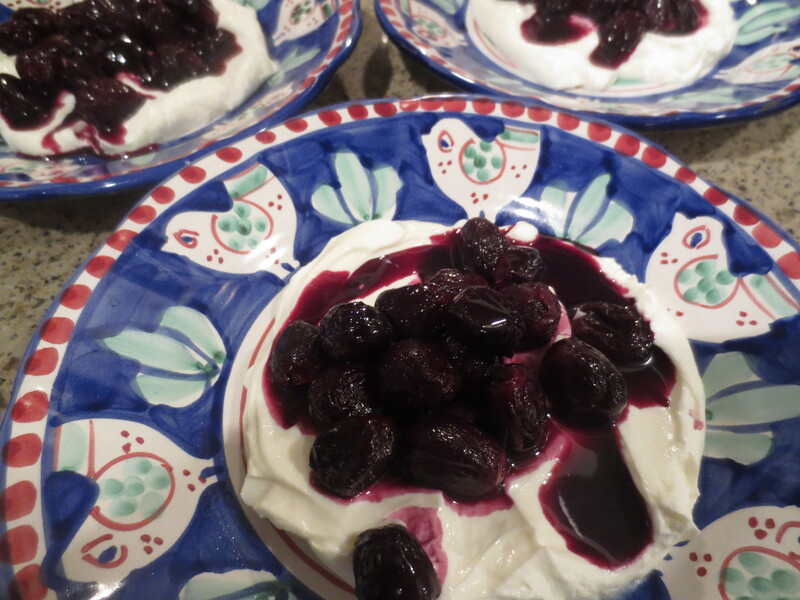 These were stewed grapes on a bed of Greek yogurt. They told me they’d cooked the grapes with sugar and something else I didn’t recognise. I gently cooked mine with a little red wine, some sugar and a little vanilla paste. I did this earlier in the day and left them to be served at room temperature. 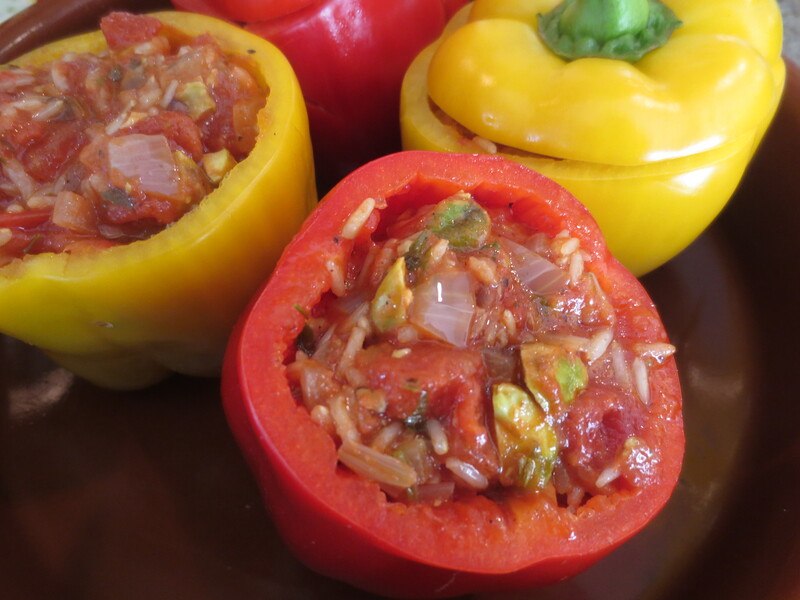 I love stuffed peppers but there is something about this recipe that is truly original. As usual it’s those little details that are a revelation. I have often cooked them for too short a time (recipes I find often underestimate cooking time). How brilliant to put olive oil, water and lemon juice around the bottom of the peppers. But the best advice is so simple: if they don’t stand well cut off a slice. To think that I have spent the last 50 years stupidly tolerating wobbly peppers! Thank you, Kay! Thank you, Jane! I have to confess the water/oil/lemon was Tonia’s idea … the whole recipe Tonia + Jamie + Kay. I wouldn’t like to apportion percentages! The ‘slice’ mine but of course not too deep or the filling will seep through. And the pistachios were a revelation. It all looks fantastic…but the dessert looks absolutely heavenly! Thank you! The dessert is so easy but tastes really wonderful.